When folded in half and stapled the outside dimensions are 2" x 2" The window ports is round cut to display the U.S. Dimes (18mm). Fold and Staple coin holders are by far the most economical way to package you're U.S. and foreign coins for storage, filing, displaying or transporting. Made from a white-surfaced cardboard with a window of remarkably strong yet clear Mylar that allows you to see both sides of the coin. Not only are these holders chemically the most non-reactive, but they are also optically perfect. Quick & easy to use - simply insert a coin, fold holder over and staple. Then you can write the date, description, and condition of the coin on the plain white border of the holder. 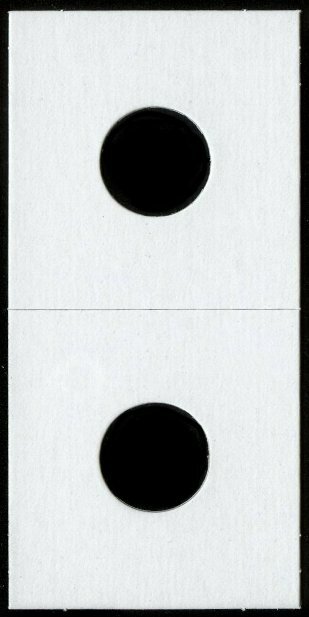 Coin Supplies > Coin Holders > Fold and Staple Holders - Mini - Standard - Crown > Standard Holders 2" x 2"